Nobody at Partners + Simons has to leave the office to make a private phone call. Instead, they slip inside one of two large, soundproof tubes in the company’s coffee and kitchen area where they can chat away. Trudy Almquist, chief financial officer at the agency, said that employees were regularly using conference and meetings room for private calls to their spouses or their children’s schools. It may be an effective tech tool, but it’s also one of the most popular tech toys: the iPad, Apple Inc.’s popular tablet computer. And last spring, every employee at Boston-based Suffolk Construction Co. received a complimentary iPad of their own. Every hire is also issued an iPad. Read: The rankings: The top Large, medium, and small employers in Mass. “The iPad is an important tool’’ for work, said Kimberly Steimle, executive vice president of marketing, but the company encourages employees to use it at home, too. Employees carry their iPads throughout the workday, using them at staff meetings and during presentations that feature renderings of building projects in progress. The iPad helps keep the costs of printing materials down - and then there are all the games, videos, and Internet surfing that workers, family, and friends can do at home. It's the ambiance as much as the food that makes lunch fun at Commonwealth Financial Network. The financial services company provides employees themed kitchen areas, where they can break away from their desks and socialize with colleagues. 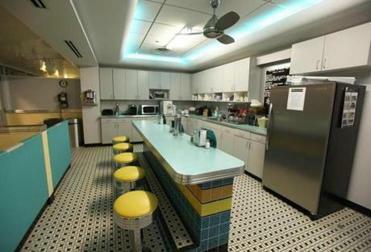 Pete’s Diner, named after the company president, is one of three themed kitchens at Commonwealth Financial. On the first floor, there’s Pete’s Diner, named after the company’s president, Peter Wheeler. That kitchen has diner booths, spinning stools, a jukebox, and vintage straw dispensers. Up on the second floor, employees can hang ten in the surf-themed kitchen, where surfboards hang from the ceiling and floor tiles resemble pebbles and sand. The kitchen is painted an ocean-blue hue, and about 50 pairs of flip-flops decorate the room. Plus, there’s a wall-size fish tank filled with blowfish and “Finding Nemo’’ look-alikes. The fourth-floor dining area is called the tree-top kitchen, because it’s all glass windows with views of the woods. Another company perk: The kitchens are stocked with coffee, tea, and hot chocolate. On Fridays, there are bagels, yogurt, and waffles, too. Talk about a company car. At John Snow Inc., employees have autos available on demand from Zipcar Inc., the service that allows members to rent cars by the hour — and they get a serious discount. Rather than pay a $75 fee to join, employees at the public health research firm pay only $25 a year (and then the regular hourly rate). The company is located in South Boston’s Seaport District, convenient to the Red Line. “A lot of us live in the city and do not have a car,” said company spokeswoman Alissa Marchant. Zipcar keeps two cars right down the street. Employees use them for business, of course, but the company encourages its workers to use the service after hours, too. When you make popular music video games, it stands to reason that you’ll have musicians on the payroll. So Harmonix Music Systems, maker of the game series Rock Band, goes the extra mile to support the company’s home-grown bands. John Drake on drums, Aaron Trites on vocals, Nick Chester on guitar, and Eric Pope on bass. Down in the basement of Harmonix’s Cambridge headquarters, there’s a hidden sanctuary where employee bands can rock out. 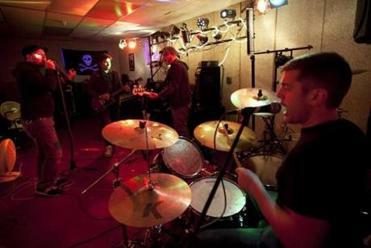 The dedicated practice space is equipped with stage lights and music equipment, and bedecked with Christmas lights for mood. It’s also soundproofed for the peace of mind of other workers. “There’s some stuff you really don’t want to hear,’’ she said. Yet some of the employee bands are so good, their songs are included in Rock Band games. It’s the tasty perk everyone wants, but few provide: Free beer. And in the office, yet. Cold brew is always on tap at HubSpot Inc.’s headquarters in Cambridge, where the kitchen has a designated beer fridge stocked with at least 50 different brands. “We have Stella, Beck’s, Guinness, Bud Light,’’ said Kara Sassone, the company’s media relations specialist, as she rattles off the more popular labels. A cold one helps to encourage employees to hang out at the office and build better working relationships, the company says. Free or not, beer -- as with all good things — is best in moderation, especially at the office. Even so, it’s a popular perk. “I’m sure if we were to get rid of the beer fridge here at HubSpot, the whole company would be up in arms,’’ blogged one employee. Healthy employees are happy and productive both at work and at home, according to officials at Millennium: The Takeda Oncology Co. So why not help them get that way? Last year, the biopharmaceutical company launched a 12-week “Healthy Biggest Loser” Challenge. Employees paid a $5 fee for small-group personal training sessions, a 30-minute nutritional consultation, and one-hour group support meetings before each weekly weigh-in. And that’s not all; there was an exercise and nutrition seminar, and a healthy cooking/eating demonstration. Each staffer chronicled their food, drinks, and exercise in a journal. After the program, the company encouraged them to continue to visit the wellness coordinator as often as they wanted to. There were 39 participants who lost a total of 152 pounds. The top finisher: a male employee who lost 21 pounds, or nearly 11 percent of his total weight. Second place was a female staffer who lost close to 18 pounds, or 9.4 percent of her body weight. They each received a cash prize. The tradition was to reward loyal employees with a gold watch to mark their years of service. International Data Group has a better idea — a vacation, and not just any vacation. In return for long service, IDG gives employees a paid trip to anywhere. Once employees reach 20 years at the research company, they are eligible to receive a travel award to a location of their choice. The award is a fixed amount meant to cover everything; family and friends are welcome. Employees can create their own customized “trip of a lifetime,’’ said Howard Sholkin, director of communications and marketing programs at the company, which has 743 employees in Massachusetts, mostly in Framingham. In the past two years, about 45 employees have taken advantage of the benefit. The destinations include Australia, Belize, Italy, Cape Verde, and New Zealand, to name a few. Imagine skating on the ice at the Garden and hanging out with the Stanley Cup-winning Boston Bruins. Now imagine doing that because your company has a really great in with the team. Dr. Neil Denbow and his family enjoyed an afternoon of skating at the TD Garden. At Hallmark Health System, that’s one of the privileges that comes with being the official health care provider for the NHL hockey team. The connection to the Bruins has meant great access to the team for employees at the health care organization, which caters to Massachusetts communities such as Medford and Melrose. Employees have met some of their hockey heroes off the ice, too. When Bruins players Andrew Ference and Brad Marchand visited Melrose-Wakefield Hospital, and Daniel Paille visited Lawrence Memorial Hospital of Medford, the athletes signed autographs, posed for pictures, and bantered with employees. Correction: Because of a reporting error, a story about company perks in Sunday’s Top Places to Work magazine misspelled Hallmark Health System. The company’s coverage area was also incorrectly described. Hallmark Health covers Medford and Melrose.